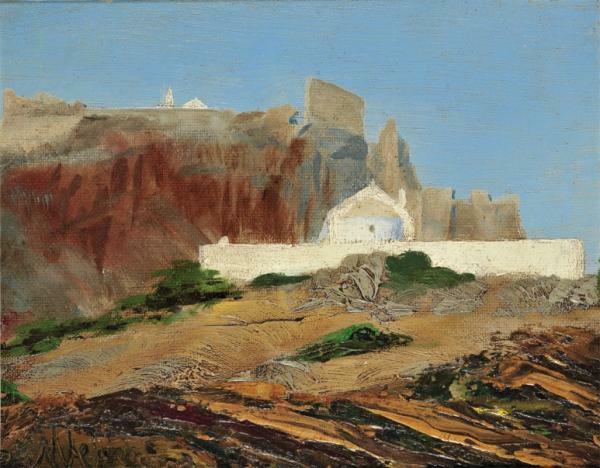 One of the leading innovators in early 20th-century Greek painting, Nikos Lytras studied in Munich and mainly focused on landscape painting and portraiture. He expressed his creative temperament in his landscape compositions. In his View of the Acropolis at Sunset, with its sensuous impasto, lavish brushwork and dynamic handling, there is no intention of a naturalistic rendering; the main pursuit, rather, is for colour itself to convey and embody the sunset light, achieving an effect of prevailing unity. Chronologically, this work is part of Lytras’ pre-1920 production. The son of Nikephoros Lytras, he studied at the School of Arts in Athens (1900-1903) and from 1907, on scholarship from the Evangelistria Foundation of Tinos, at the Munich Academy. He came into contact with German Expressionism and the works of the artists of Der Blaue Reiter. He returned to Athens in 1911 and in the aftermath of the Balkan Wars participated in the exhibitions of the Association of Greek Artists. In 1920 he showed his work jointly with the sculptor Grigorios Zevgolis, with whom he shared a studio. In 1917 he was a founding member of the ‘Techni’ group of artists. In 1923 he was appointed professor at the Athens School of Fine Arts. In 1929 a posthumous retrospective exhibition was held at the Zappeion Hall in Athens, and in 1936 his work went on display at the Venice Biennale. 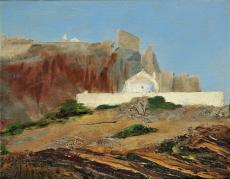 An innovator in early 20th-century Greek painting, he influenced its development through his teaching and his modern approach. His maininterests included portraiture and landscape painting.